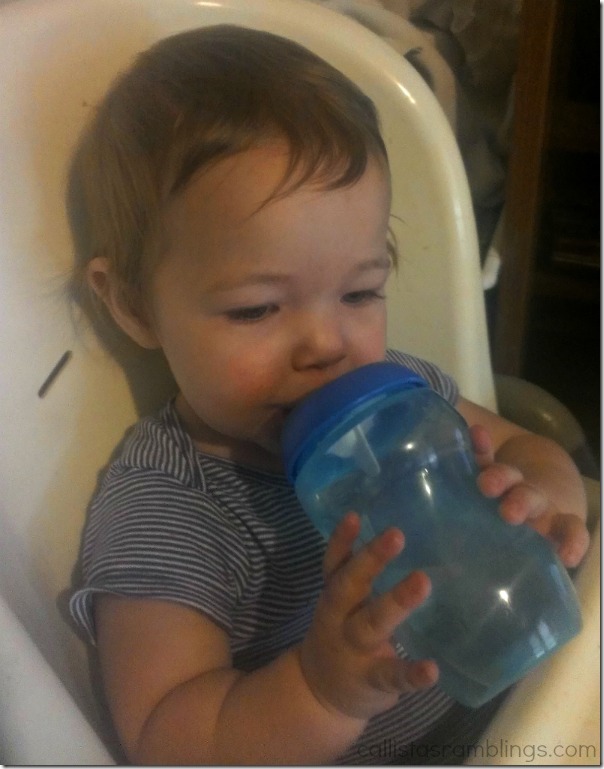 When your child gets old enough to to hold a cup, most parents introduce a sippy cup first to minimize spills while their child is getting used to holding and drinking out of a cup. I’m now on child #5 going through the sippy cup learning stage and this is pretty much how it goes. You spend money buying different cups trying to find one that doesn’t spill but isn’t impossible for your child to drink from. You also want a lot because they inevitably get lost under the couch or left in your car. I know, I’ve been there. Tommee Tippee recently sent me some of the sippy cups in their new line to try out with my youngest and I have to admit that I figured they would have the same problem as all the other cups we had tried. I was pleasantly surprised though that the cups have NOT leaked, even while laying on their side under the highchair for hours. They don’t leak when she drinks them (except of course for when she purposely sips the water into her mouth and then spits it back out – silly kid!) The ones we tried are the third from the left, designed for ages 9 months and up. Let’s look at some of the many problems I’ve had with other sippy cups and how the Tommee Tippee cup holds up against them. It spills even though it’s “spill proof” I can only speak for the design we tried but it hasn’t spilled yet, not even when on it’s side for hours, hidden behind furniture, not even with water which tends to spill more. The valve is hard to clean The valve is easy to clean and curdled milk will not get stuck in it. The valve falls out when my kid throws/drops the cup and then it spills out. There is no danger of the valve falling out if it’s in correctly. It is actually hard to get OUT of the lid so I can’t see it falling out. The cup cracks when my kid throws/drops the cup. I didn’t spend hours throwing the cup but so far it’s held up to my daughter and is made of very thick plastic. I would be surprised if it broke. The new line of cups are designed for ages 4m+, 7m+, 9m+ and 12m+, have interchangeable lids and bases and are dishwasher safe. If you want to try Tommee Tippee cups for yourself you can get them in Canada at Walmart or Babies R Us. In the USA look at Babies R Us, Target, Meijer, Kohls, CVS Pharmacy, Walmart, H-E-B and you can try online at amazon.com and buybuybaby.com. The cups are available in 1 pack and 2 pack offerings, ranging in price from $5.99 – $8.99. Tommee Tippee makes lots of others baby products like soothers, bottles, spoons and plates. Disclosure: I received compensation in the form of product for this post. Regardless all opinions are honest and belong to me.